DUBAI, United Arab Emirates (AP) — Iran test-launched two ballistic missiles Wednesday emblazoned with the phrase "Israel must be wiped out" in Hebrew, Iranian media reported, in a show of power by the Shiite nation as U.S. Vice President Joe Biden's visited Jerusalem. The new missile firings were the latest in a series of tests in recent days, aimed at demonstrating that Iran will push ahead with its ballistic program after scaling backing its nuclear program under the deal reached last year with the U.S. and other world powers. Israel, long an opponent of Iran, offered no comment on the test, though Biden issued a strong warning over any possible violation of the nuclear deal. "A nuclear-armed Iran is an absolutely unacceptable threat to Israel, to the region and the United States. And I want to reiterate which I know people still doubt here. If in fact they break the deal, we will act," he said. Biden's comments came after meeting Israeli Prime Minister Benjamin Netanyahu, who strongly opposed the nuclear deal. The tests, however, don't violate the accord. The landmark deal, which led to Iran dramatically scaling back its nuclear program, does not include provisions against missile launches. Also, when the nuclear accord came into effect on Jan. 16, the Security Council lifted most U.N. sanctions against Tehran including a ban it had imposed in 2010 on Iran testing missiles capable of carrying nuclear warheads — a ban that likely would have covered some of the missile fired this week. To deal with the restrictions in the nuclear agreement, the councill adopted a resolution last July which among other measures "calls on" Iran not to carry out such tests. At the United Nations, there is likely to be a debate about whether Iran is still required to abide by the ballistic missile test ban under council resolutions. Iran says none of its missiles are designed to carry nuclear weapons and so the resolutions do not apply. One Security Council diplomat said the tests don't violate the nuclear deal, but "there are obligations on Iran" that stem from the resolution and "they need to abide by those obligations." he said. Another diplomat acknowledged, "We're not mounting an argument that it's a binding obligation." The two diplomats, speaking on condition of anonymity because they were not authorized to speak on the tests, said the council still has to consider the reported launches and if verified determine whether it is a violation and if so what action to take. Iran state TV trumpeted Wednesday's test as officials boasted that it demonstrated the country's might against longtime nemesis Israel. 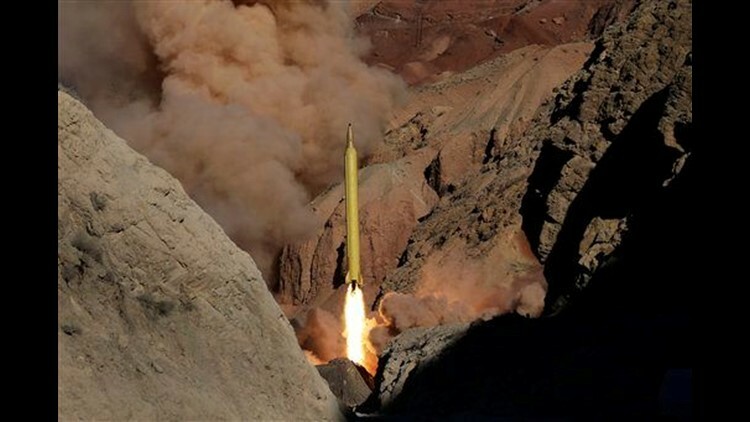 Video aired on state TV showed the golden-hued Qadr H missiles being fired from a crevice between brown peaks identified as being in Iran's eastern Alborz mountain range. The rockets hit targets some 1,400 kilometers (870 miles) away off Iran's coast into the Sea of Oman, state media and Iran's semiofficial Fars news agency reported. The U.S. Navy's 5th Fleet, which patrols that region, declined to comment on the test. Amir Ali Hajizadeh, the head of the Revolutionary Guard's aerospace division, was quoted as saying the test was aimed at showing Israel that Iran could hit it. Israel is within 1,100 kilometers (660 miles) of Iranian territory. He stressed that Iran would not fire the missiles in anger or start a war with Israel. "We will not be the ones who start a war, but we will not be taken by surprise, so we put our facilities somewhere that our enemies cannot destroy them so that we could continue in a long war," he said. The Fars news agency reported the Hebrew inscription on the missiles. Writing messages on bombs dates as far back as World War II. During Israel's 2006 war with Lebanon's Hezbollah militants, Israeli children were photographed writing messages on artillery shells in a community near the border. More recently, pictures emerged online of U.S. missiles bound for Islamic State group targets that had "From Paris with love" written on them, referring to last year's IS attacks in the French capital. Iran's message for Israel seemed timed to coincide with Biden's stop in the country on his Mideast tour. Iran has threatened to destroy Israel in the past. Israel, which is believed to have the only nuclear arsenal in the Mideast, repeatedly has threatened to take military action against Iran's nuclear facilities. Over the past days, Iran has launched a number of missile tests as part of military exercises. On Tuesday, the Revolutionary Guard said the tests included several missiles with ranges between 300 and 2,000 kilometers (185-1,250 miles), including the Shahab-1 and -2, the Qiam, with a range of 800 kilometers, and the Qadr. A U.S. State Department spokesman on Tuesday criticized those launches, saying Washington planned to bring it before the United Nations Security Council. The Qiam and Qadr, each capable of carrying payloads greater than 500 kilograms, fit the U.N. definition for missiles capable of carrying a nuclear warhead, said Jeremy Bennie, Middle East and Africa editor for IHS Jane's Defence Weekly. The now-lifted 2010 ban covered missiles with a range of at least 300 kilometers (186 miles) and a payload capacity of at least 500 kilograms (1,102 pounds), under a definition by a U.N. panel of experts. The nuclear accord was a victory for Iran's moderate president, Hassan Rouhani, over hard-liners who sharply opposed reining in the nuclear program. But since the deal was reached, hard-liners in the military have made several shows of strength. In October, Iran successfully test-fired a new guided long-range ballistic surface-to-surface missile. U.N. experts said the launch used ballistic missile technology banned by the Security Council. In January, the U.S. imposed new sanctions on individuals and entities linked to the missile program. In January, Iran seized 10 U.S. sailors in the Persian Gulf and held them for about 15 hours when their two riverine command boats headed from Kuwait to Bahrain ended up in Iranian territorial waters after the crews "misnavigated," the U.S. military said. Associated Press writers Edith M. Lederer at the United Nations, Aron Heller and Daniel Estrin in Jerusalem, and Joseph Krauss in Cairo contributed to this report.